Citizen science is a great teaching tool. In the Educator Corner, we hear from teachers who have partnered with Earthwatch’s Urban Resiliency Program in Los Angeles to enhance learning opportunities for their students. They share tips and inspiration about involving students in tangible contributions to science. Contact us to learn more about becoming a partner with Earthwatch. Maura Palacios Mejia is a Lecturer at California State University, Los Angeles and a PhD Candidate at Texas A&M University. 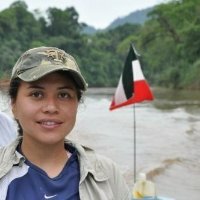 Palacios Mejia partnered with Earthwatch in 2015 in order to integrate citizen science into the classroom for her course “Writing for Biologists 320”. We asked her about her experience and about why she recommends her colleagues and other teachers to get involved with Earthwatch as educators. How did you integrate the Resilient Trees project into your syllabus? The Resilient Trees Project was incorporated into the syllabus of the Writing for Biologists 320 course at California State University, Los Angeles in three forms. The first was the introduction of the material via the PowerPoint provided by Earthwatch with slight modifications to accommodate our class. I added iclicker questions and gave students information regarding logistics and field safety. I brought the field equipment and samples of the leaves, flowers, fruit or seeds to the classroom so the students would become familiar with identifying tree species and using the sampling methods. Next, we went into the field to do sampling in groups of five students. Students did fieldwork in two different parks in Los Angeles – Debs Park and Hermon Park – to maximize results. Lastly, each student wrote up a research paper on topics related to the data they collected in a bigger context. Students connected what they learned in the field with topics related to urban forests like pollution, climate change, drought, and health benefits. What made this project appealing in terms of integrating it into your classroom plan? Three major aspects of this project were appealing for students in this class. The first was introducing them to the concept of citizen science, where anyone can complete training and contribute to science. Another aspect was how the project was in local environment where students live their everyday lives. The field sampling is a great opportunity for students to connect to the natural environment via sampling and relate what they observe locally to major ongoing issues in science. The contribution of students to a real ongoing project was also great incentive for student participation and achieving a high success rate in the field data collection. Many students collected data beyond the minimum requirement because they enjoyed the experience. Would you recommend other teachers/professors adopt this project into their lesson plans, and if so, any words of encouragement you would want to share with them? I would definitely recommend other teachers and professors to participate in this wonderful project because the students get a sense of accomplishment and an experience they can share with others over their lifetime. By acting as citizen scientists, students are naturally incorporated and exposed to real world science in their community. For me, taking the classroom outdoors and seeing the reaction of students to their own discoveries is always the most rewarding part of my work as an educator. In addition, the writing exercise is a fascinating way to demonstrate the critical and analytical thinking of the student’s perspective in different scientific possibilities driving the biology and diversity of trees. Meet Our Community Collaborators: Monica C.
Don’t receive our newsletter? Sign up today! See the impact that green space makes on parks and urban areas. Every month, you will receive updates on our projects, researchers, results, and volunteer opportunities. We will never share your email address.